An extreme rarity and famously powerful amulet in solid gold custom waterproof casing; The Kumarn Tong Dood Rok first edition hand carved tiger tooth amulet. The Kumarn Dood Rok carved 1st edition amulet is one of the rarest talismanic charms of this great Master of the Nakorn Pathom Province; Luang Por Chaem, of Wat Ta Gong. Luang Por Chaem empowered the Kumarn in various materials, including ivory, horn, sacred powders, baked clay, stone, tiger tooth, wood, and bone. Some were carved by artisans, or Luang Por himself, and others were carved by devotees themselves and brought to Luang Por for empowerment during the ceremony. Because many devotees made their own carvings for Luang Por to empower, one finds a large variety of different materials used, with ivory and tiger tooth of course being the most rare substances of all.The Kumarn Tong comes with solid gold custom waterproof casing included. and Free EMS Shipping Worldwide. After the first early era and first edition Kumarn Tong were made, the temple decide to make other editions thereafter using metallic alchemical alloys, in order to have a uniformly recognisable form for each different edition. Each edition had its own idiosincrasies and design features. In all cases, the Kumarn Tong Dood Rok amulets of Luang Por Chaem are all recognisable for the agedness, be they metallic or carved from natural substances or animal remains. 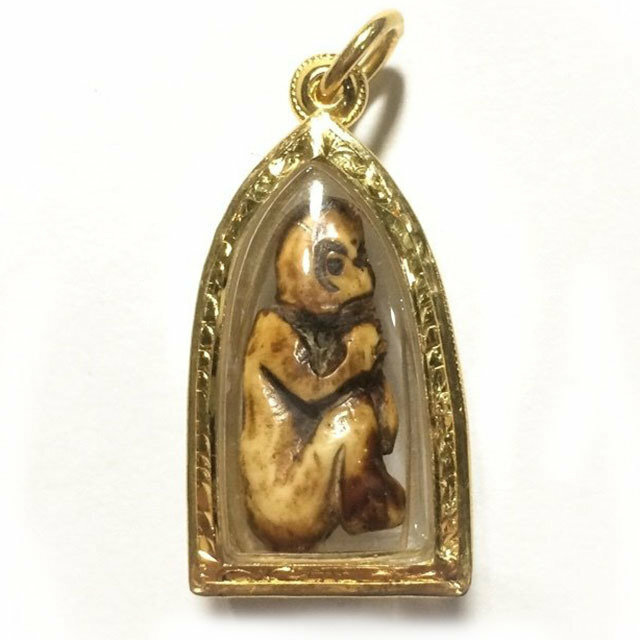 Devotees of this great Master Monk stand by the Kumarn Dood Rok of Luang Por Chaem for its Choke Lap Luck Bringing powers to induce lottery wins, attract customers and increase business sales, and increase popularity through mercy charm. Luang Por Chaem Intachodto was a Pra Gaeji Ajarn Master Monk of Olden Days of the Nakorn Pathom Province, who was extremely revered as one of the top Masters of the region, along with other names like LP Noi, LP Bun, Perm, Phern and other World Famous Masters of the Region. His fame reached far and wide from the north to the south of the country, making him a Nationally revered Monk. He was known for his powerful Puttakom Wicha Akom (Buddha Magic Powers), and lived during the Era of other great Masters of equal fame such as Luang Por Kong of Wat Bang Gaporm, Luang Por Jad, Luang Por Jong (Wat Na Tang Nork), Luang Por Ee (Wat Sattaheeb), and the Great Kroo Ba Srivichai. The amulets of Luang Por Chaem have been revered around the country since his first ever edition of Monk Coin, the Rian Roop Muean Run Raek 2484 BE, which was distributed to Thai Soldiers during the Indo-China Wars, which rendered many miraculous stories of Kong Grapan magic saving the lives of those soldiers who wore his amulets. In those days it was ubiquitous with almost all Masters to make coin amulets either in Roop Khai oval shape, or Rian Sema shield shape, but Luang Por Chaem's first edition coin differed to all other coins of that era, being round but with 16 starlike points on the edges (Representing the 16 Buddhas Yantra), and Luang Por Chaem seated with crossed rifles on the floor in front of him. Luang Por Chaem was born circa 2405 BE, and was interested in Khom Sacred Agkhara script from a very young age, which he learned from Pra Ajarn Joy, a local sorceror Monk in his local temple at Wat Don Chedi, who was highly Adept in many Wicha. Pra Ajarn Joy recognised the potential abilities of the young Luang Por Chaem, and bestowed him with the secrets of his Wicha. As Luang Por Chaem reached the age of Ordination, he was Ordained into the Monkdom (Sangha) at Wat ta Gong in the area of his Birthplace, and received the ordained Surname of 'Intachodto'. After Ordination, Luang Por Chaem focused on multiple aspects of practice, including that of the administration of a temple, and of Vipassana Tura (proper meditation mindfulness practices according to the Buddha's teaching of techniques), as well as Magical Wicha, and became very able in all areas of his duties and interests. He also was able to travel and learn Wicha from some of the great Nakorn Pathom Region, such as Luang Phu Bun of Wat Klang Bang Gaew, Luang Por Ta, of Wat Paniang Dtaek, and many other Masters of the time. His Mastery of the Wicha he had inherited from these masters became legerndary around the region, making him one of the most popular masters of his time for Kong Grapan, and Buddhakhun Choke Lap Metta Maha Niyom Magic. His amulets are very difficult to find and highly prized, and hold a high value in a amulet collector circles for their rarity and certainty of power. Amongst his most popular amulets are of course the Rian Roop Muean Run raek firtst edition coin, the Kumarn Dood Rok, Rian Sema 2485 BE, Pra Din Hnaa Tapone, Look Sakot Parort, Takrut, and other Talismanic Charms. One can count oneself very lucky to encounter one of his amulets in the present day, as their owners never wish to sell their amulets of Luang Por Chaem. The rian 2484 BE first edition coin carries an extremely prohibitive price, for the many miracles reported by devotees who fought during the Indo-China Wars and during the time the Japanese Incursion was in effect. The first bedition coin gained the nickname 'Rian Pat Put Dtaan', and also 'Rian Gong Jakr' The coin is recognisable for its 16 starpoints and for having a soldered pendant hoop, and was made only in Nuea Tong Daeng sacred copper, but in blacked, and reddish versions.The rear face features a Yant Pra Rahu Eclipse God Astrological Yantra. Luang Por Chaem is seated in the center of the coin with no cushion, and a pair of crossed rifles on the floor in front of him, which is part of the Dtamra Saiyasart for the stilling and silencing of guns. LP Chaem holds up his hand, with the Khom Agkhara 'NA' on the palm, and the words 'Luang Por Chaem Wat Ta Gong, with the Khom Agkhara 'A' and the Khom Pali Kata 'NA MO PUT TAA YA'. The sixteen starpoints represents the Kata Pra Putta Jao Sip Hok Pra Ongk 'NA MA NA A, NOR GOR NA A, GOR OR NOR A, NA A GA ANG'. There are two different block presses, the 'Block Hoo Diaw' (single ear) and 'Block Sorng Hoo' (two eared) models. the one eared model has only the right ear visible, whereas the two eared model has both ears visible. Both models are equally rare and preferred, and considered equally powerful. Luang Por Chaem Passed away in the year 2490 BE at the ripe old age of 86 years old, after 76 years of Ordination.